The ANP held yesterday (7/11), in Rio de Janeiro, the second stage of signing of contracts related to the 15th Round of Bids, held in March this year. Present at the ceremony were directors of the ANP and the Minister of Mines and Energy (MME), Moreira Franco, as well as representatives of the companies. In all, 12 contracts, of ten companies, were signed: BP Energy do Brasil Ltda . ; Chevron Brasil Óleo e Gás Ltda . ; Equinor Brasil Energia Ltda . ; ExxonMobil Exploração Brasil Ltda . ; Murphy Brasil Exploration and Production of Oil and Gas Ltda . ; Petrogal Brasil S.A .; Queiroz Galvão Exploration and Production S.A .; Repsol Exploração Brasil Ltda . ; Shell Brasil Petróleo Ltda . 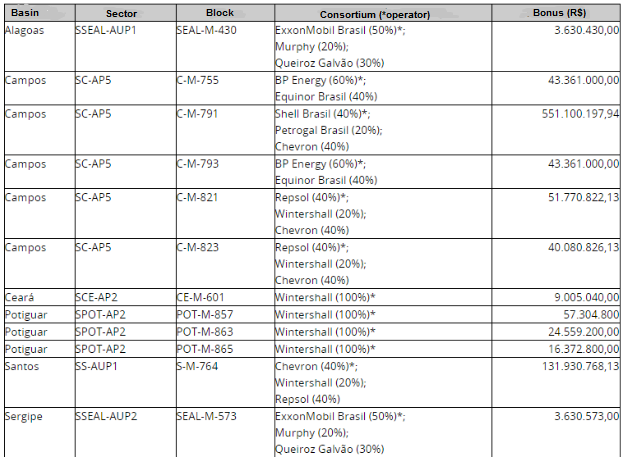 ; and Wintershall do Brasil Exploração e Produção Ltda. In the 15th Round of Bids, in the concession model, 22 blocks were sold by 12 bidders. The first stage of signing the contracts was held on 9/11. At the occasion, ten contracts, of five companies, were signed: Equinor Brasil Energia Ltda . ; ExxonMobil Exploração Brasil Ltda . ; Petróleo Brasileiro S.A; QPI Brasil Petróleo Ltda. ; and Shell Brasil Petróleo Ltda. These companies requested advance notice of the signing of the contracts, since the announcement of the 15th Round provides for the delivery of the signature documents by September 28 and signature by November 30.